The weather has been extremely hot in Belgium over the past three days. On Friday evening, the temperature hovered around 30C and therefore I felt a great urge to eat some seafood as a reminder of summer holidays. To me, shellfish and fish are always a reminder of summer and holidays. If there is one dish which I crave for but which alas is so difficult to find away from the Mediterranean is a pasta with sea urchins which is pure heaven when sea urchins is available. It is normally the first thing I try to eat whenever I go back home to Malta. It is also something I look out for when I am in the South of Italy or Sicily. I headed to the fish shop close to our home to see what inspired me. Many times this is how I get inspiration for cooking. Nothing beats the joy of having no plan for lunch or supper and improvising on the basis of what you find on the market. I found the famous Moules de Bouchot (small mussels from France which are incredibly tasty) and therefore mussels it would be for dinner, together with a mix of shellfish including calamari and scallops. Few things reminds me of the sea and the taste of the sea more than fresh mussels. And while Belgium, France and the Netherlands are renowned for their mussels, they are cooked slightly differently in the Mediterranean. The main difference is that extra virgin olive oil is used instead of butter and no celery is used. Belgium is known for many things. Its beer, chocolates, french fries and also mussels. There are many restaurants specialising in mussels and the methods of cooking them vary considerably. I prefer mine the Mediterranean way. In this case the simpler the recipe the better the result. Many tell me that they find cooking shellfish or fish intimidating. I tend to disagree. I started cooking in my 20s and it was with fish and shellfish that I actually started. Once you get past the basics (which basically means finding a fishmonger you trust and asking how to cook things which you would not normally consider), you can be sure to go ahead for more complicated fare. So the first recipe I share on this blog is a simple one. The only complicated thing is to clean the mussels which trust me is part of the fun. 3 cloves of garlic finely chopped. 1. Clean the mussels. On many occasions, the mussels can be bought already cleaned compared to the past where you would need to remove not only the beard but sometimes also dirt which stuck to the shells. To remove the ‘beard’ is easy. Pull towards you with a knife and force the beard out. 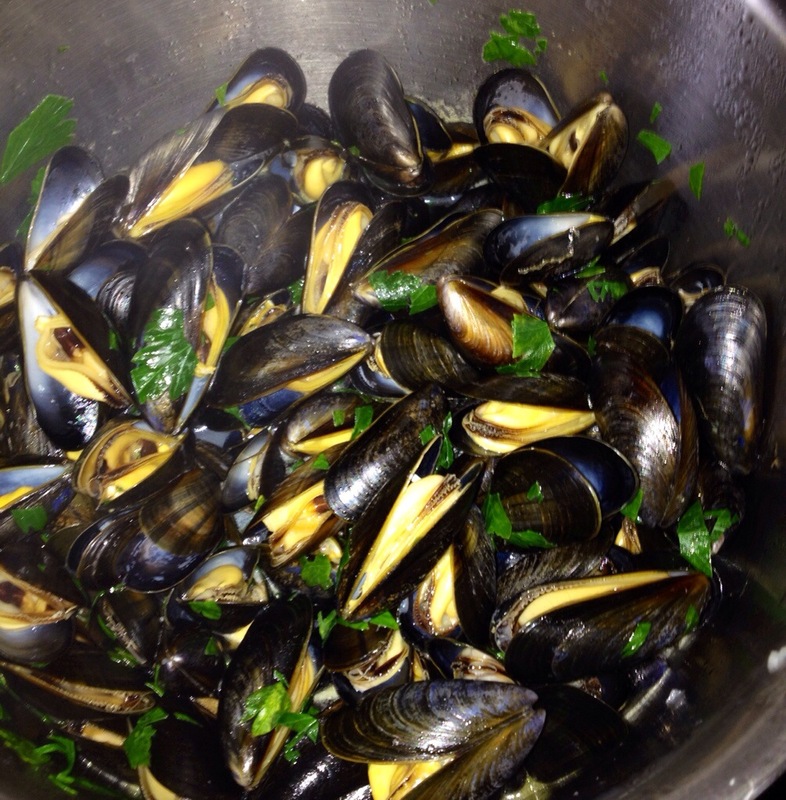 Once you clean the mussels, place them in a bowl of clean water. Go through each one and discard any which are open or which float in the water. You can keep them in the fridge until you cook them (the day you buy them). 2. Crush the garlic and chop roughly, then sweat in the extra virgin olive oil (around three tablespoons). Then add a splash of wine (a cup of wine should be enough) and bring to boil. 3. Once the mixture is boiling add the mussels and parsley and put a lid on the saucepan. Give the pan a shake from time to time but try not to open the lid too often. The mussels should be ready within minutes when you see that they are all open. 4. Mussels are salty so you do not need to add any salt but they are extremely good with freshly ground black pepper. Serve immediately ideally with fresh bread to dip into the ‘soup’ at the bottom of the pan. Wine suggestion: It is the common norm to drink white wine with shellfish or fish. In this case, nothing goes better than a white wine. I had this with a Vermentino from Sardegna which worked extremely well. You could also try it with a Sicilian fruity white such as a blend of Insolia and Chardonnay or a French Muscadet.